The Outlaw Gardener: What Next? Oh! Of course I wondered why you weren't blogging. I've missed your postings. Happy to know you're still alive, and though, not yet well, getting there. I am so glad you got to the hospital in time. Thoughts and Prayers are with you for a speedy, full recovery. Take care of yourself! It's time for your plants to pamper you. Rest, relax and recuperate while the plants provide you with some joy but will do just fine with a little tough love for the moment. Speedy recovery! Only you could make a stay in the hospital sound like a vacation. Love you my friend and I am so thankful you're healing. This post sure took an unexpected turn at the end! I'm glad you're doing better now! I was frankly worried by your silence and tempted to contact a couple of people closer geographically with inquiries but that seemed intrusive. I was relieved when I saw a couple of comments from you but still concerned. I'm very glad to hear that you got the care you needed and that you're recovering. I'd hoped you were on vacation but I didn't imagine one of exactly this type! You seemed to have gone to great lengths to get a vacation from blogging. Next tune just say you are taking a break. ;) I do wish you a speedy recovery. I hope you feel like sharing all. I will miss you while you are recovering. Take care. Dearest Peter ~ I pray that your recovery will be swift and complete. Resting will be good for you and aid in your healing. Your blogging family will be here when you return. OMG Peter.... what a scare! I'm so glad you got to it on time, and that you're on the mend. I hope you have a wonderful, restorative, and restful few weeks at home, where you can take in all the spring bounty with no other worries than watching the hummingbirds fight over it. Be well, my friend! And here I thought you were just on vacation! My sister recently had a similar experience. So glad you got fixed up and are taking it easy. 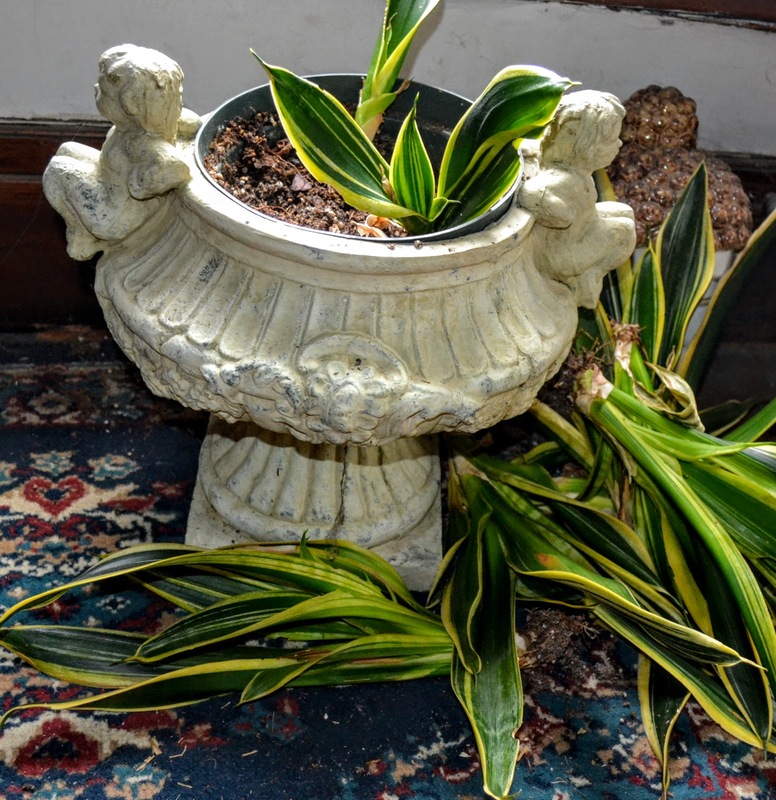 We can't have you falling apart like your poor potted plant. Holy crap Peter! So glad you're OK & on the mend! Take good care of yourself - glad your sense of humor wasn't harmed during this misadventure, it'll help get you through anything. It must be heartening to see so many good wishes for your full recovery here from your followers. I join in with them in hoping that you are back in fine fettle soon. But of course if you are still feeling slothful, there's nothing wrong with that either. Take care of yourself, there's only one of you and you're it. So sorry to hear your news, but glad that you discovered it in time and are now on the mend. Your plants and garden can wait, you are the important one and must take care of yourself.Lots of love winging over the ocean to you! Even if you never post another word, your archives are full of delightful things worth re-reading, looking at again, and listening to again. Thank you and get well soon. Dearest Peter, I'm so sorry about your illness, and do hope you'll better soon. But we have only one heart and MUST take care on it. Now your health is the principal thing. Oh dear, what an awful scare. I hope you are feeling much better now and that you will soon be back full of energy and full of enthusiasm for your garden and your blog. In the meantime you will be missed. Peter ! I had no idea what you have been going through .. I am so glad you have had the proper attention and you ARE RESTING ! That is what is MOST important ... the garden will survive .. the blog will be there when you are ready again .. but you are the most important being in this whole scenario right now .. take VERY good care of yourself and don't worry .. when it is time, you will feel the same love and excitement about gardening and blogging again ... I promise ! Just relax ... heal .. and enjoy your life !! Oh my gosh! I'm glad you caught the issue in time. Best wishes for a complete recovery. Get well, be happy. So glad you got some medical attention! Get well soon, Peter! Here I am, outside the United States on vacation, and this is the first opportunity to check my oldest and favorite garden blog, and here you are, going through all this medical emergency and trauma. My heart goes out to you, Peter: I pray for your quick recovery. I sure hope you'll get your mojo back soon. I'll be back state side at the end of April. If you need any kind of gardening assistance, don't hesitate: I love working in other people's gardens. Good health and quick recovery to you my friend! P.S. the Sansevieria can be saved. Any part of the leaf can start rooting, with a little patience.